The Southern Baptist Convention needs integrity, leadership and to stand for orthodoxy against progressivism. For too many years Southern Baptists have viewed Calvinism and Traditionalism as the division in our Convention. That isn’t what divides Southern Baptists. What divides Southern Baptists are those who hold to an orthodox understanding of the Gospel as opposed to progressives who promote ethnic Gnosticism and the “tearing down of all hierarchy” to empower feminism in the church. This division between orthodox Christians (and despite our differences, Calvinists, non-Calvinist Traditionalists and Arminians all fall within orthodoxy on soteriology) must end so that we may stand shoulder-to-shoulder in the great battle of our time—fighting the Social Justice corruption of the Gospel. What better way to unify than for a strong Traditionalist to nominate a good, conservative Calvinist? Or for that matter, a strong Calvinist to nominate a good, conservative Traditionalist? Such a move would demonstrate that minor divisions must be put aside for the greater good of all Christians. 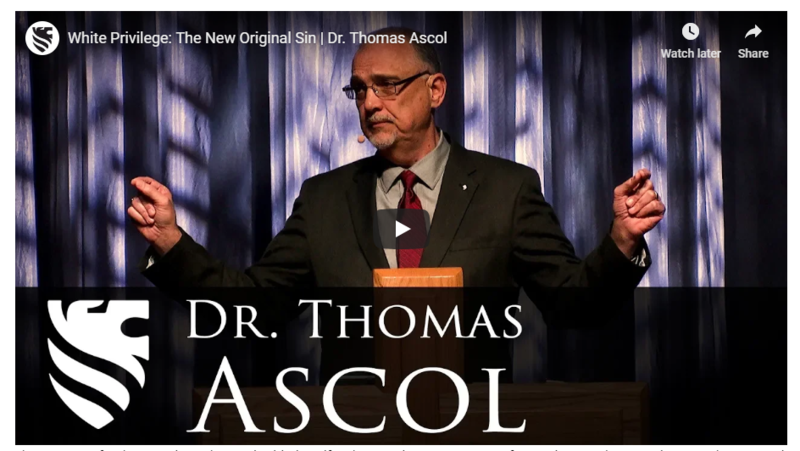 This is why I would strongly urge a Traditionalist to nominate Dr. Tom Ascol for SBC President. Someone should nominate him for the presidency in Birmingham. In 2019. While that might violate the new tradition of the current president running unopposed for a second one-year term, the crisis within the Southern Baptist Convention necessitates putting aside such a tradition. The current president of the Southern Baptist Convention, J.D. Greear has embraced the Neo-Marxist lie of white privilege (something rejected by theologians like JP Moreland and SBC leaders like Dr. Tom Ascol.) The current president of the SBC believes Christians must be advocates for LGBTQ+ rights. The current president of the Southern Baptist Convention believes Muslims and Christians worship the same God. The current president of the Southern Baptist Convention in a tweet conversation with the theological train wreck Beth Moore urged the “tearing down of all hierarchy” over the church’s treatment of women. This is a crisis. This is what creeping progressivism looks like as it devours a denomination. Within a short time, the Southern Baptist Convention will resemble the United Methodist Church if this is left unchecked. The only check to progressivism is a strong, orthodox leader. I believe Dr. Ascol is that man. His presentation at the recent conference on Social Justice & the Gospel was a stirring defense against the Neo-Marxist racial assumptions. His dynamic, thoughtful lecture was heard by over 1,700 conference session attendees and watched by countless more on the Internet. He is a leader with a voice heard within not only the Southern Baptist Convention, but all of evangelicalism. Dr. Ascol is a man of integrity. As such, I believe he would lead not as a Calvinist, but a Southern Baptist committed to unifying and representing all our theological traditions. The most important job of the president in many ways is the appointment of trustees. I feel confident that Dr. Ascol would appoint conservative Southern Baptists of all traditions in consult with state convention leaders. These trustees would hold entity heads accountable and not enable their wild, progressive moves. Otherwise, we will see only more Democratic campaign work out of our tithes and offerings as the ERLC becomes more blatant about where it stands. Southern Baptists were warned about J.D. Greear’s progressivism before the debacle in Dallas. Unfortunately, not enough conservatives bothered to attend the convention meeting to stand against it. Birmingham 2019 provides a new opportunity (see: Why You Should Attend The SBC 2019 Annual Meeting in Birmingham). To foster this spirit of comity, I’d encourage a strong Calvinist to nominate a good Traditionalist as SBC Vice President. There are many fine examples like Dr. David Allen or Dr. Adam Harwood. Let Birmingham 2019 be the start of a new grand coalition of conservative Southern Baptists who refuse to surrender to the spirit of this age, but stand strong for the Gospel. The time is now. Let’s not wait until next year. Separator image Posted in Commentary, Evangelical Political Theology. Why do Southern Baptists intimidate the press? I could never support a calvinist. If the only options are a social justice warrior communist and a calvinist, them I’m done with the southern baptists. A Calvinist can do as much if not more damage than a Progressive. I’m a Traditionalist. I signed the Traditional Statement. I don’t like Calvinism as a system because I think it results in divine causal determinism. However, we Southern Baptists have a long history of being able to work together–Calvinist and non-Calvinist. I see the threat from these progressive, post-modern folks as a true crisis that distorts the Gospel and will destroy the Southern Baptist Convention. Differences like soteriology matter, but I think this other stuff matters even more.